Richard Wayne Penniman (born December 5, 1932),known as Little Richard, is an American recording artist, singer and musician.Penniman is known for his dynamic blend of jump blues, gospel, New Orleans rhythm and blues and boogie-woogie as well as charismatic showmanship that led to him being one of the founding fathers of the rock and roll genre of the mid-1950s. 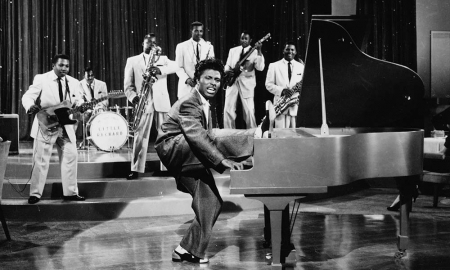 "Ready Teddy" is a song written by John Marascalco and Robert Blackwell, and first made popular by Little Richard in 1956.Little Richard sang and played piano on the recording, backed by a band consisting of Lee Allen (tenor saxophone), Alvin "Red" Tyler (baritone sax), Edgar Blanchard (guitar), Frank Fields (bass), and Earl Palmer (drums).It has since been covered by Buddy Holly, The Tornados, Elvis Presley, Tony Sheridan and others,making it something of a rock and roll standard. The composition, an uptempo rock and roll song, received its largest ever recognition on the evening of September 9, 1956, as Elvis Presley sang it in front of some 60 million television viewers during his first appearance on The Ed Sullivan Show at CBS, a broadcast which received a Trendex percentage share of 82.6, the largest ever obtained in the history of U.S. television. It was later used in Federico Fellini's La Dolce Vita (1960) as a version by Italian rocker Adriano Celentano.